“What is the best mayonnaise?” can be argued endlessly, with valid claims for Hellman’s, Kraft, Duke’s, Best, or home-made. Some people simply love Miracle Whip, and nothing else. 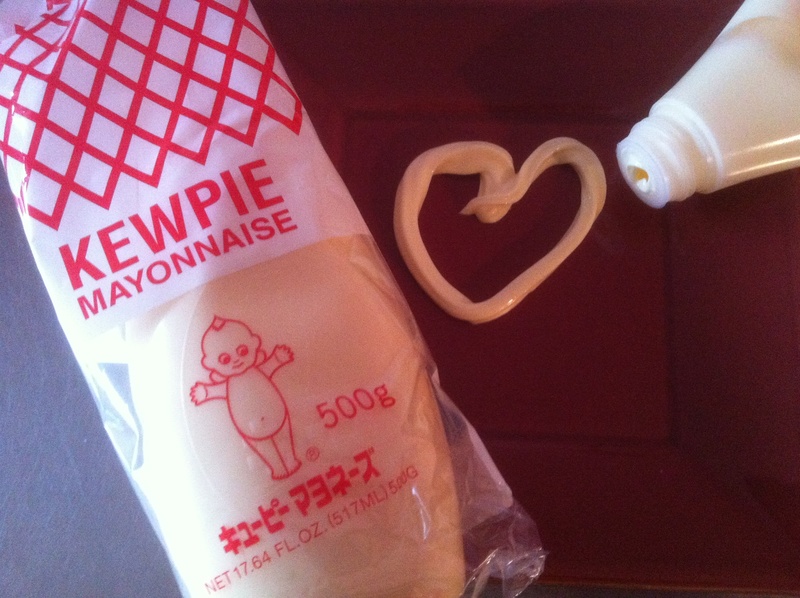 But in our house, nothing exists except Kewpie Japanese Mayonnaise, in the squeezy-soft plastic bottle. Meilin discovered its charms while living in Tokyo, and this condiment makes an incredible Japanese-style egg salad. The special thing about Kewpie is that it’s made with egg yolks and rice vinegar, which makes it tangy, with a touch of MSG for umami taste. One of our lads wouldn’t eat chicken nuggets with anything else, and we use it on vegetables–cooked or raw–such as broccoli and asparagus. Kewpie makes a good dip for carrots. A little squirt added to a vinaigrette will give the salad dressing an instant creaminess. If you unscrew the red top, there is a larger star-shaped opening for decorating food with flair. Cover two large eggs with cold water in a saucepan, then bring to a boil, covered. Turn the heat to low, and cook eggs for 13 minutes, covered. Remove the eggs, and put them into cold tap water to cool. Peel the eggs, then smash them coursely with a fork in a small bowl. Add 1½ to 2 Tablespoons of Kewpie Mayonnaise, salt, and fresh-ground black pepper. Mix. Can be eaten with chopsticks, or a fork, or made into a sandwich. Cook German sausages (preferably beef) or even beef hot dogs. Squirt a little ketchup (yes, ketchup) on them, sprinkle on a little curry powder (Penzey’s makes a good one) and then squirt on some Kewpie Mayo.